We love Spinach Artichoke Dip at our house, so much that we can easily make it a meal. Actuall, there are a lot of dips that we can make a meal of, but that is probably not something I should brag about. Recently I had a package of spinach that I needed to use ,and I didn’t think I should serve my family a dip for dinner this evening, nor did I feel like having another spinach salad. 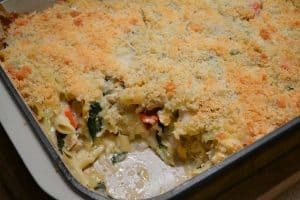 Here is the pasta dish I made for dinner this evening that uses the same ingredients as that Spinach Artichoke dip that is so popular. I added chicken, but my daughter Ashton thought the chicken could be left out and it would be great as a side dish as well. I think it can be used for a family dinner, but you could also serve it if you were entertaining. It has a creamy Swiss cheese sauce and uses plenty of butter and cream, which makes it pretty decadent. It is the holiday season, after all! I added the red pepper because I thought it would be pretty with the green spinach and so festive during this Christmas season! Give it a try – I don’t think you’ll be disappointed. Melt 2 tablespoons of butter in a large skillet over medium heat. Add the onion and cook until soft, about 5 minutes. Add the red pepper and garlic and cook 2 to 3 more minutes until garlic is fragrant. Add the spinach and nutmeg, cook until the spinach is wilted, about 3 minutes. Transfer to a bowl to cool. In the same skillet melt 3 tablespoons butter over medium heat. Whisk in the flour and cook for about 2 minutes until bubbly. Gradually add the chicken broth, heavy cream and the white wine. Bring the mixture to a boil, reduce heat and simmer for about 5 minutes until sauce thickens. Remove pan from the heat and whisk in the Swiss cheese until melted. Season to taste with salt & pepper. In the bowl with the spinach mixture, add the cooked pasta, cooked chicken, artichoke hearts, and cream sauce. Mix until well blended and pour into a greased 9 X 13 casserole dish. In a small bowl, melt the remaining 3 tablespoons butter. Stir in the panko or fresh bread crumbs and Parmesan cheese. Sprinkle on top of casserole. Bake at 350 degrees for 30-40 minutes until bubbly and topping is beginning to brown.